December 1 marks the beginning of the Christmas baking season and I always like to start my baking with something Christmassy. Since candy canes are a symbol of Christmas, Candy Cane Cookies seem fitting. These cute little cookies are tender crisp with a buttery sweet almond flavor. There is no denying that kids love these cookies, but adults seem to enjoy them every bit as much, especially with a hot cup of tea. When you look at these Candy Cane Cookies you would think they are difficult to make. While I agree they are a little more labor intensive than say, a regular sugar cookie, it is not hard work. In fact, this would be a great time to get your kids involved, as their small hands are well suited to the task of rolling the small balls of dough into a rope shape. So first we must make the cookie batter, which follows the basic instructions of beating the butter with the sugar, adding two egg yolks and vanilla and almond extracts, and then beating in the flour. There is no baking powder or baking soda in this recipe, as we do not want the cookies to rise while they bake, as this would distort their candy cane shape. The first time I made these cookies I made them peppermint flavored, since candy canes do taste like peppermint. While tasty, the second time I made the cookies I replaced the peppermint extract with almond extract, and the results were much more to my liking. Of course, if you want these cookies to taste like peppermint, simply replace the almond extract with equal amounts of peppermint extract. The other thing about the batter is that two egg yolks are used instead of whole eggs, and this is done to give the cookies a richer flavor. As always try to use a good quality unsalted butter, and use extracts that are labeled "pure". Now, once the cookie batter is made it is divided in half, and to one half red food coloring is added. You can use either regular 'liquid' food coloring, the type you can easily buy at grocery stores, or you can use a red paste food color. If you find the batters too soft, then place in the refrigerator for 30-60 minutes or just until firm. Then, take about a walnut sized piece of dough from each of the two batters and separately roll them each into a rope shape, that is about 4 - 5 inches (10 - 12.5 cm) long. Twist the two ropes together and place on your parchment lined baking sheet. Shape the cookies into a cane shape by curving one end into a hook shape. I like to gently smooth the edges of the two ropes to soften the lines between the two colors. Once you roll out the cookies place them on the baking sheet. (If you find the cookies a little soft, just pop the baking sheet in the refrigerator for about 15 minutes to firm up the cookies before baking.) The cookies are baked in a moderate oven just until set and the edges of the cookies are barely tinged with brown. Do not over bake. Place the baking sheet on a wire rack to cool, as the cookies will be quite soft and fragile. These cookies will keep, well wrapped, at room temperature for about a week. The cookies can also be frozen. 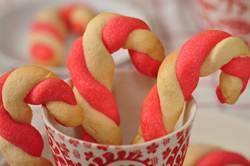 Candy Cane Cookies: In a bowl, whisk the flour with the salt. In the bowl of your electric mixer (or with a hand mixer), beat the butter and sugar until creamy. Add the egg yolks and vanilla and almond extracts and beat until combined. Scrape down the sides of the bowl as needed. Add the flour mixture, in three additions, and beat until you have a smooth dough. Remove half of the dough from the mixing bowl. To the remaining half add the red food coloring and beat on low speed until well blended. If you find the dough too soft, cover and refrigerate for 30-60 minutes. Preheat oven to 375 degrees F (190 degrees C) and place rack in center of oven. Bake cookies for about 8 - 10 minutes or until set and the edges of the cookies are just starting to brown. Do not over bake. Remove from oven and let cookies cool completely on baking sheet. Cover and store in an airtight container for about a week. These cookies can be frozen. Brennan, Georgeanne. Christmas Sweets. Chronicle Books. San Francisco: 2006. Wilson, Dede. A Baker's Field Guide to Christmas Cookies. The Harvard Common Press. Boston: 2003.